At the time, everyone in Pittsburgh's Stanley Theatre knew they were witnesses to history. Bob Marley stood tall and proud onstage and beckoned them to Get Up, Stand Up, and they responded loudly with wo yo yo yo. Later they discovered the history they witnessed was, in fact, Marley's last performance. 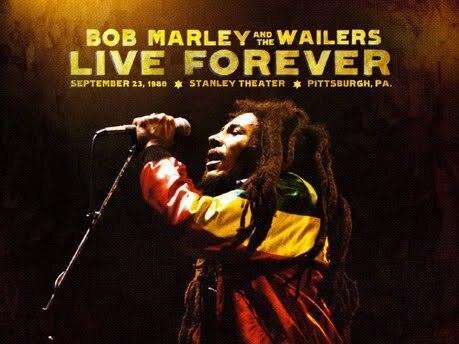 Live Forever encapsulates the pure energy of that fateful performance by Jamaica's most legendary son. The original live recording, captured on tape by Marley's engineer Dennis Thompson, has been lovingly preserved and remastered for the 30th anniversary album release exclusively in the Caribbean. Adding to the distinctiveness of the collection-worthy album is the special eco-friendly packaging. Bob had ascended to the pinnacle of his career when he took to the stage in Pittsburgh; he had just completed a successful European Uprising tour and had played on sold-out bills in New York's Madison Square Garden. Simply put, he had arrived. Everything about the concert was a reflection of Marley - the superior production, the masterful collection of musicians and the eclectic range of songs, emphasising the complexity of the man turned superstar. As widely respected journalist Patricia Meschino alluded to in the Live Forever album liner notes, "He was an anointed African freedom fighter celebrating an independent Zimbabwe, a visionary reggae emissary, straight from "yard", on Jammin', and an exiled leader inciting the movement of Jah people on Exodus. A compelling ghetto griot, Bob warned of the impending consequences due to the continual marginalisation of the poor on Burning and Looting and Dem Belly Full; he was a purveyor of peace decrying War and insisting on No More Trouble and a progressive spiritualist glorifying the Natural Mystic. Effectively resolute in his desire to chase those Crazy Baldhead out of town, and in his excoriation of The Heathen, he was also a quintessentially cool roots-rocker, skanking to Carlton and Aston Barrett's deeply grooved drum and bass cadence on the instrumental break of Rastaman Vibration. An irresistible suitor who coyly asked Is This Love? Bob was also a vulnerable, absolutely riveting romantic in his passionately conveyed rendition of No Woman No Cry. The album also includes live renditions of: Uprising, Coming In From The Cold, Work, Zion Train, Redemption Song and Could You Be Loved. The entire concert, from his opening song to the final applause, spans the special double CD album.